China Airlines is showing some amazing prices from Vancouver to Myanmar (RGN), Bali (DPS), Jakarta (CGK), Surabaya (SUB) and Singapore (SIN) at the moment. 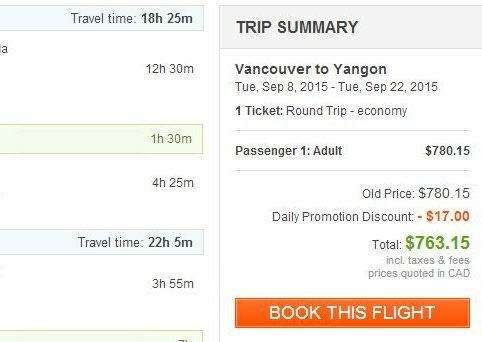 The price to Myanmar is perhaps my favorite, as I don't think I've ever seen to an amazing price to this destination before, from anywhere. Very limited dates in September 2015 . With such limited dates, this might not last very long. 2. Click through from Kayak to FlightHub for booking. Read about what to watch out for when booking with FlightHub, in the Third Party Power Rankings guide. Where to stay in Myanmar, Bali, Jakarta, Surabaya, or Singapore ? The following AirBNB links will lead you to some great deals on places to stay for under $50 CAD per night for 2 guests. vancouver, yvr, flight deals, asia, southeast asia, china airlines, bali, denpasar, dps, indonesia, singapore, sin, jakarta, cgk, myanmar, burma, rgn, yangon, rangoon, surabaya and sub. 2 Responses to "Vancouver to Myanmar (formerly Burma), or Bali, Jakarta, Surabaya, or Singapore - $765 CAD roundtrip including taxes"
As always Chris I appreciate and become very excited about the possibility to travel whenever! 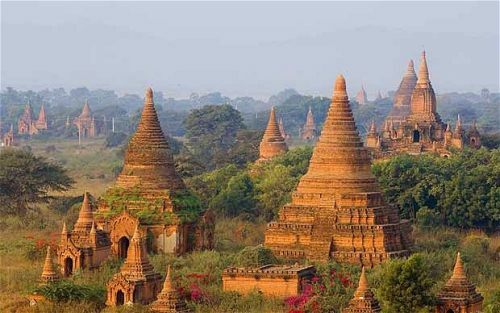 With this particular deal to Myanmar for example however it is said that the weather if Poor, further "Tourist numbers remain very low and much of the country is hard to reach by road and beach resorts remain closed." So unfortunately it simply looks like the low price is associated with how undesirable Monsoon Season can be. Thanks Bernard! Googling around, it would seem that September is generally a transition month from the wet to dry season, and is at the tail end of the wet season. Which of course is usually statistically preferable to being there in the *middle* of the wet season. "Another month of change as the rainfall starts to subside and temperatures also drop, although don’t expect snow anytime soon with temperatures remaining in the high 20’s and even early 30’s°C. Rainfall and temperatures will continue to fall as October approaches. We speak from experience (4 separate trips to Burma made in September by the SA team) when we say that the September, especially the second half, can deliver some excellent weather conditions whilst visitor numbers remain lower." It's one of those months that's a bit of a 50/50 gamble to be sure.